This photograph is a new addition to the Museum’s archive. It is of the British military staff appointed to the Supreme War Council in 1918 which included two officers in The King’s Royal Rifle Corps. 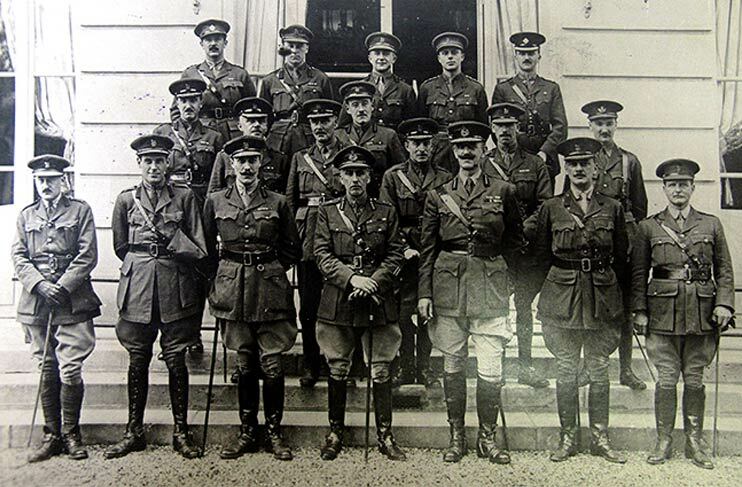 The British military staff to the Supreme War Council, 1918. Front Row centre: Maj-Gen the Hon C.J. Sackville-West KRRC. Second Row, Second Right: Maj P.J.R. Currie KRRC. The Supreme War Council was established in November 1917 in Versailles to coordinate Allied (Anglo-French) military strategy during the latter part of the First World War. The council served as a forum for preliminary discussions of potential armistice terms and peace treaty settlement conditions. Major-General the Hon C.J. (Charles) Sackville-West, KRRC, was appointed the head of the British military staff, later succeeding Field Marshal Sir Henry Wilson (Rifle Brigade) as the British Permanent Military Representative on the Council following the latter’s appointment to be Chief of the Imperial General Staff in February 1918. Major P.J.R. (Jack) Currie, KRRC, was a Grade 2 staff member of the British military staff. The photograph is one of a number in an album kept by Major Currie which his son, Lieutenant-Colonel W.F.P. Currie, has recently deposited in the Museum’s archives.